Yeast is a one-celled fungus (a living organism) that exists in many forms. For baking (fermentation) purposes, it produces carbon dioxide when mixed with warm water, flour, salt, and/or sugar, which cause expansion in dough. Fermentation has been a part of bread baking and alcohol production for centuries. It was not until the invention of the microscope that Louis Pasteur isolated yeast as the responsible property behind rising breads and alcoholic beverages. Shortly after, in 1868, brothers Charles and Max Fleischmann arrived in America with a yeast cake recipe. Active Dry/Rapid Rise/Bread Machine – These are often referred to as baker’s yeast. Active Dry - The most commonly used and recommended for hand-kneaded dough. Available in 1/4-ounce, 3-strip packets and 4-ounce jars. Rapid Rise and Bread Machine yeasts - Fine-grained. Will cause a “single-rise” reaction, which makes them more efficient in machined dough. Rapid Rise is sold in 3-strip packets and Bread Machine yeast is sold in 4-ounce jars. Cake Yeast/Fresh Active – Foil-wrapped, compressed square cakes. Two sizes available: 2 ounce and .06 ounce. Cannot be used in bread machines. This type is typically used by commercial bakers. Wild Yeast – This is the “starter” that many cooks keep alive in a crock. Each week, 75% of the starter is replaced with water and flour to keep it growing. 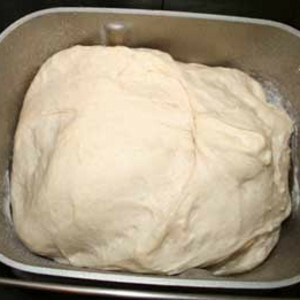 The live yeast that is removed is used for baking or discarded. Most artisan breads are made from wild yeast. Starter or sponges are not as reliable as packaged or cake yeasts. Other yeasts that are not used in baking include brewer’s (for beer), nutritional (for health benefits), and yeast extracts (known as Vegemite in Australia). These are not live yeasts and, therefore, are consumable as is. Fresh yeast is perishable. Refrigerate and protect from air, light, and heat for up to four months. If kept on a shelf, packaged and jarred yeast are not usable past the expiration date. However, they can be refrigerated for several months or frozen for up to a year. Always bring to room temperature before using. Active dry yeast requires proofing, unless otherwise noted on the package. To proof, heat 1/4 cup water to 105-115 degrees. Add yeast and sugar or flour. Foaming should begin within 5 minutes. If there is no activity, the yeast is old or the water was too hot. Yeast reacts to external temperatures. In a cool kitchen, dough may be slower to rise. In a warm kitchen, faster rising will lessen the wonderful yeast taste. Rapid rise yeast breads tend to be less flavorful.